This site provides a pictorial history of Patten Mines Railroad. 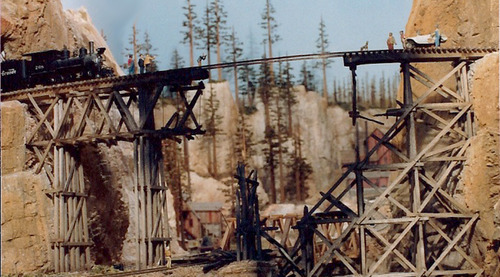 Located off the coast of Alaska on a small island, Patten Mines Railroad began as a simple route from the mines to the coast for shipping to the mainland. As time went on other industries such as logging and fish processing developed. Progress continues to proceed as the railroad looks to the future. Left wing liberals committed to saving the Grey Spotted Owl are believed responsible for destroying this landmark bridge, dedicated to local fire safety expert, G J Ritter.